It should be obvious by now that one of our prime objectives while in Australia is to experience as much as possible, regardless of how familiar we may be with said experiences. We’ve approached every possible trip, festival and event thinking “can we do it?” instead of “I’m not sure about this one”. This attitude has served us well, leading us to heaps of interesting events and places. Therefore, it should be no surprise that, when we found out that the Rugby World Cup was being hosted in New Zealand, our first thought was “why not?” We looked into available weekends, picked up tickets for a Saturday night quarter finals game, and booked a flight to Auckland for the weekend. When we arrived in Auckland in early October, we were thrust into a world of, well, generally enthusiastic rugby supporters. 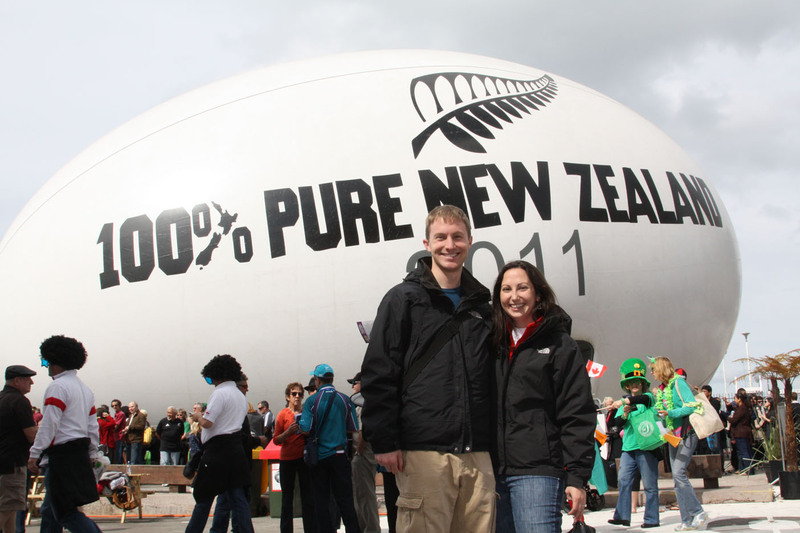 Coming from rowdy sports towns like Chicago, we were expecting a little more, um, rowdiness, but, this being our second trip to New Zealand, we’ve determined that “rowdy” is pretty low on the list of adjectives to describe Kiwis. “Thrillseeking” maybe, but for the most part the events we attended, including the match itself, were pretty tame. That said, we saw France and England play, not the All Blacks (New Zealand’s national rugby team), so maybe the French and Brits were all jetlagged. 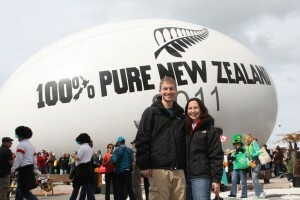 Having arrived on Friday night for a Saturday night match, we had a day to kill in Auckland before heading to Eden Park. 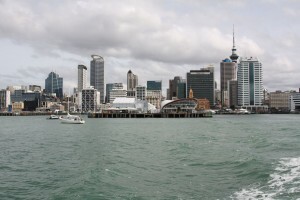 Auckland may be New Zealand’s largest city, with over 30% of the population, but in a country of just around 4.5 million it’s still not an especially big place. 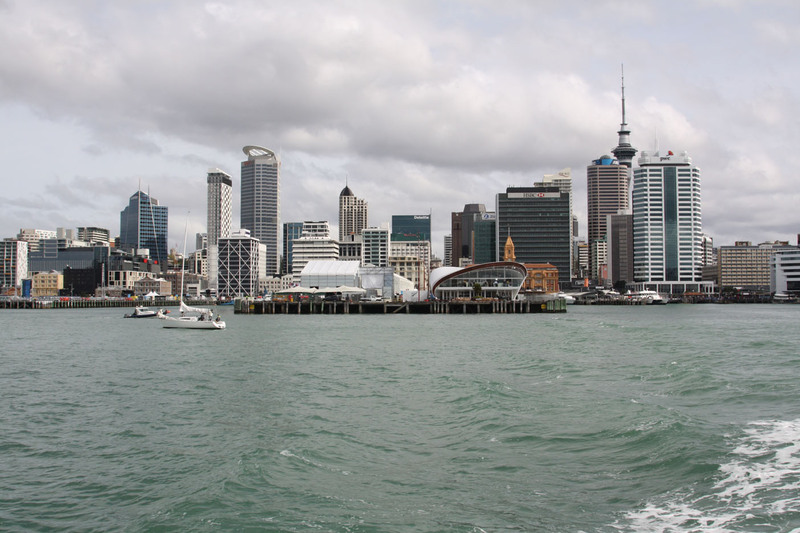 We walked through the CBD and checked out some of the festivities, but found ourselves with a few more hours to kill, so we took a ferry across the Waitemata Harbour to the historic suburb of Devonport and got some lunch. Returning from Devonport after some more wandering, we caught a train from the Britomart Transport Centre to Eden Park, where the match was being held. With rain showers threatening, we walked from the Kingsland train station to the stadium and found our seats, at which point we pulled up mobile Wikipedia and went through a quick refresher of the rules of rugby union. 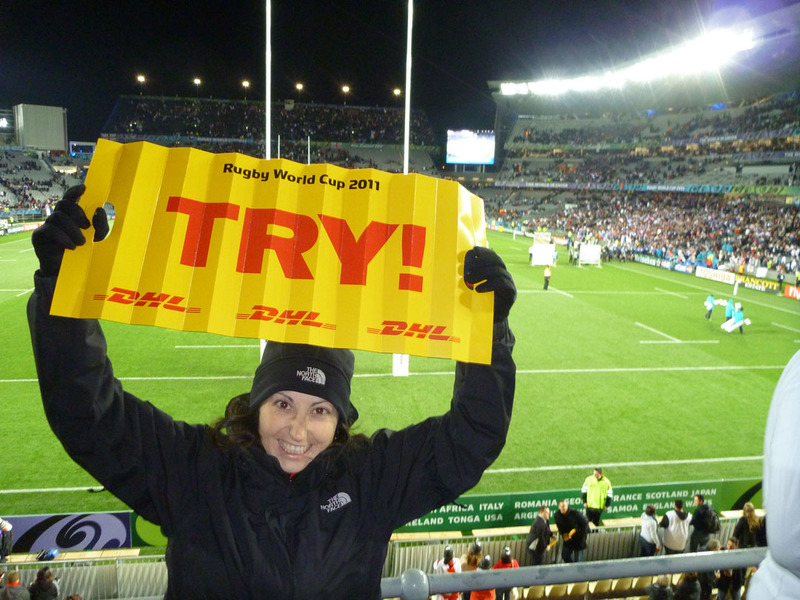 At this point it should be evident that, while we were certainly very excited to be at the Rugby World Cup, we hadn’t actually attended a rugby match before and therefore had almost no idea what was going on. It occasionally looked like American football (“gridiron” over here), which proved to be a problem since the cheers one might yell during gridiron are not at all the same cheers used for rugby. We did eventually pick up the general rules of the game though, and since we didn’t choose an allegiance to either side, we went with the safe option of cheering whenever the majority of the crowd around us did. After the end of the match (France won, 19-12), we squeezed back onto a train that traveled ever so slowly back to the city, where we had left our rental car. We picked up the car, flipped on the GPS, and made our way back to the hotel to get some rest for an early wake up call the next morning. While working in Melbourne, I was discussing the finer points of visiting New Zealand with a coworker (hi John!) In the course of the discussion, he mentioned that, several years prior, he and his wife visited New Zealand and went on a Black Water Rafting tour. Intrigued, I looked up Black Water Rafting and found that one of the best places for this type of thing is two hours south of Auckland, near a small town called Waitomo. While the prospect of floating and hiking in caves through freezing water may not seem exciting to you, it sure sounded fun to me, so I signed us up for the 5 hour “Abyss” tour, starting at 9am. So, after that early wake up call, we drove south to Waitomo and began our Black Water Rafting adventure with 6 other brave souls, led by our guides Matt and Jah. 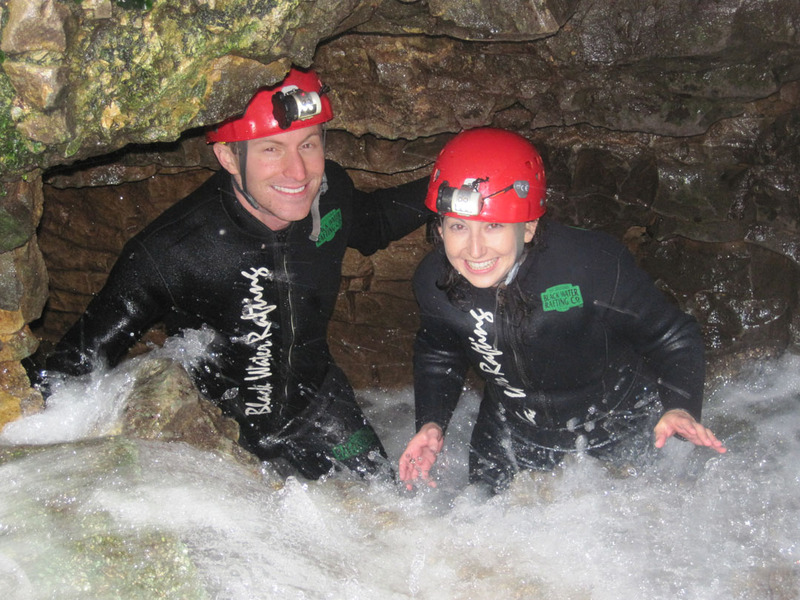 After a 100ft abseil (rappel) into the cave, we zip-lined, paddled, waded, and crawled through the caves of Waitomo, eventually scaling two waterfalls to get out of the caves. 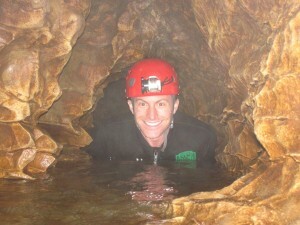 The caves of Waitomo also host one other interesting natural phenomenon. If you’ve seen the “Caves” episode of the BBC series Planet Earth, it starts with a segment on cave-dwelling maggots. Living in total darkness, these maggots “fish” for their prey with long strands of mucus and attract said prey with a bioluminescent blue glow. Called “glow worms” (because “glow maggots” doesn’t look as nice on brochures), these larvae cover the ceiling of the caves. At one point during our adventure, we all turned off our headlamps and were treated to a beautiful display of twinkling blue light overhead. After emerging from the cave and heading back to base for some dry clothes and hot soup, we found that there was another glow worm cave nearby. Since tickets were half price after our rafting tour, we decided to stop by, since our guides said that the glow worms in that cave were even more spectacular, plus we could keep our normal clothes on. For this tour, instead of wading through the water, a guide took us on a boat through the caves to see the constellations of glow worms overhead. Way easier, to be sure, but not nearly as fun! After driving back through the North Island country side, we were almost back to the hotel when we saw a sight that we hadn’t seen in months: a Wendys! After a fantastic dinner of burgers and frosties, we called it a night before catching a Monday morning flight back to Sydney. Check out more pictures from this trip here and here. We made it out of the cave!